NOTE - See my final Feb. 23 post "CCHIT - dissolved involuntarily in April 2008 for failure to file annual report required under laws of the state of Illinois." The posts before that date as below were written before I received requested documents from the Illinois Secretary of State's Dept. of Business Services. These documents are now posted at the link above. Also see my second Feb. 17 post here, and my third post on Feb. 19 here where I commented on HisTalk's take on these issues. I have observed unseemly things about health IT in my nearly two decades in medical informatics. For example, my dealings with health IT vendor HBOC (no relation to HBO and now merged into McKesson) whose erstwhile CEO was cooking the books, and a-little-too-cozy relationships between hospital CIO's and health IT vendor CEO's. Even considering those observations, the matter below is quite unsettling if its allegations are valid. It is additionally unsettling considering the many well-intentioned volunteers who give of their time in CCHIT activities, whose reputations might be unfairly tarnished if there are significant undisclosed problems. (I applied to be a volunteer some years ago, in fact, but was not selected initially, and did not reapply due to my work schedule). Seen at the WSJ Health Blog here about the CCHIT (Certification Commission for Healthcare Information Technology) is the post below. An involuntarily dissolved organization? Conflicts of interest with HIMSS, the Healthcare Information and Management Systems Society (a healthcare IT vendor alliance), and other "front" organizations? I do not know who posted this series of allegations, and importantly do not represent them as true; they may be rumors, misinformation, politically motivated or statements of disgruntled individual(s). However, I checked one of the allegations and verified it. I utilized Illinois' online corporation/LLC search utility at http://www.ilsos.gov/corporatellc/CorporateLlcController and did indeed find this puzzling entry for CCHIT as "involuntarily dissolved" on 4/11/2008. I could not find other entries even under the full name "Certification Commission for Healthcare Information Technology." Edgar online company search finds no company listings for "CCHIT" or "Certification Commission for Healthcare Information Technology", either. Another private nonprofit lookup of unknown reliability, Melissadata.com, shows CCHIT as a 501 (c)(3) in Chicago listed as "exempt" from taxes since October 2008, last 990 form ("Return of Organization Exempt from Income Tax") filed Dec. 2007, form 990 amount $4,740,146, as shown here. This would have been before the involuntary dissolution. No 2008 form 990 data is shown. A number of reasons for involuntary dissolution of a nonprofit in one state can be seen here. Why was this not for profit "involuntarily dissolved" in April 2008? For what reason(s)? Why was this dissolution not widely known? What is CCHIT now? Is the Illinois online corporation/LLC database faulty? Does it remain a non-profit? If the Illinois database is not faulty, where is CCHIT now registered? Is it registered? Is it a subsidiary of HIMSS or other organization? Where do CCHIT monies go? Who assures that it is indeed impartial in its assessments? Some facts are known about the Certification Commission for Health Information Technology. The Certification Commission for Health Information Technology (CCHIT) is a defunct Illinois Not-For-Profit 501(c) 3, which operates to take money from the Office of the National Coordinator and Vendors by offering to sell a “Certification”. CCHIT was formed as a NFP in the State of Illinois and is an entity spawned by none other, HIMSS.org. CCHIT is no longer a legal entity existing within the State of Illinois effective April 11, 2008, but continues to engage business as a 501(c) 3 accepting payments as reported by J. Morrisey, Director of CCHIT Communications (February 3, 2009). 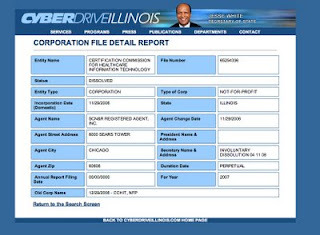 CCHIT continues to hold itself out to take money for the sale of “Certification” (a rubber stamp device the buyer can display on his product if the fee is paid), a contrived performance standards product label developed by its parent organization, Healthcare Information and Management Systems Society (HIMSS), a lobbyist, with headquarters at 230 E. Ohio St., Chicago, Illinois. CCHIT was also located within the HIMSS Headquarters at 230 E. Ohio Street in Chicago but moved to Wacker Drive apparently due to appearances of being too close to the lobbyist parent organization. CCHIT, through the organization that spawned them—HIMSS.org, a lobbyist organization—recently asked for $25 Billion additional funds in an open letter to the Obama administration (http://www.himss.org/advocacy/). HIMSS, through its agent H. Stephen Lieber, provided CCHT with $300,000 seed money in 2006 with which to fund a startup operation. HIMSS receives money from CCHIT as a subcontractor, as the payoff for seeding the startup. HIMSS provides public commentary through the use of its own members for certification criteria back to CCHIT. HIMSS is also the parent company for the Electronics Health Record Vendor Association (EHRVA), another Not-For-Profit housed at 230 E. Ohio St., Chicago, Illinois. 5. CCHIT operates fraudulently within the State of Illinois and in the United States to take money from vendors of electronic health record systems and from taxpayers; the CCHIT business practice presents as a Pay-For-Play scheme; if the vendor pays, CCHIT certifies the product conveying a competitive advantage in the marketplace. There is no transparent certification testing for 3rd party review. The costs to certify are in the many tens of thousands per vendor. Officers and Directors of CCHIT have taken money in exchange for “Certification“, knowing its 501(c) 3 operational status to be defunct. 6. CCHIT, a dissolved entity and defunct 501(c) 3 Not-For-Profit, receives funding from the Office of the National Coordinator (ONCHIT) and is tied to a lobbyist organization that claims to be a Not-For-Profit, HIMSS.org—the organization that spawned CCHIT and which formerly housed the entity in its corporate headquarters located at 230 E. Ohio St., Chicago, Illinois. Why does CCHIT continue to certify vendor products when its own corporation has been involuntarily dissolved? Does the word “MONEY” ring a bell? CCHIT should NOT be allowed to receive future Federal grants and monies from the United States Government as part of the stimulus package. CCHIT is defunct, moreover the cozy relationships between CCHIT, ONC, CMS, HITSP and others are bankrolled with taxpayer money and money from HIMSS.org and its others. Through all the smoke and mirrors we the people are supposed to trust these [derogatory term redacted - ed.] and they actually think we are buying it? I find these allegations potentially very troubling regarding an organization that is supposed to be "impartial" and a judge of the suitability of electronic health records products for sale here in the U.S. The answers may be simple and straightforward. I hope they are. Healthcare IT already has significant problems and needs no more. These are important issues worthy of clarification. I would welcome clarifications from CCHIT, which I will certainly publish here. 4. CCHIT operates with the oversight of both its board of trustees - managing its business functions - and board of commissioners, which provides oversight of its certification development programs and inspection processes. 6. CCHIT now operates independently of HIMSS, AHIMA and NAHIT - its founding organizations - and no money provided by ONC for developent or by vendors for the conduction of inspections is returned to those organizations. This still does not explain the involuntary dissolution nor the absence of an "active" entry in the Illinois' online corporation/LLC search utility. I have sent Ms. Reber an initial inquiry. It also does not explain possible conflict of interest concerns. If CCHIT operates independently of HIMSS, AHIMA, and NAHIT, why are individuals from some of these organizations acting as Trustees? Why are vendor officials acting as Commissioners? Our conflict-of-interest rules have been carefully developed to create an environment that maximizes objectivity, productivity, and integrity of process. We accept no advertising revenues from any source. Our employees are not permitted to own stock shares in medical device or pharmaceutical firms, and we verify this by examining each employee’s federal income tax return. We go beyond the industry norm to ensure that you receive unbiased guidance. There could be something material about this whistle blower's allegations. The reporter ought hire an aggressive attorney. Upon examining the medical records sent to me that were generated by a CCHIT "certified" machine, I saw first hand the degree to which these records were unusable as a tool to determine the clinical events that lead to the patient's current medical crisis. The format of the records violate all standards of medical data organization to the point that I asked, how could this company's product be CCHIT "certified". It makes me wonder if a more apt name is "seesh*t" because that is what I saw. The group should be investigated as a scam. I posted this yesterday evening in the body of my essay after discovering it. However, further questions remain as above, and as per my email to you this morning. Perhaps Ms. Reber meant to say, "that is its current status after we made good on the required state paperwork ten months after we were involuntarily dissolved." See my followup post here. I totally agree that the information about Mark Leavitt is factually incorrect. He never worked for HIMSS. That's funny. It's too bad the CCHIT is practically defunct now that the ONC's made CCHIT certification just as valuable as any other organization's. This information is a tragic! As someone who never really worked at HIMSS, he shouldn't be claiming it. I really should tell my friends about this. It's great I found this post. Keep it up! A Vendor/Doctor Dialog On Healthcare IT? Who Supports Fibromyalgia Patient Advocacy?